The demands on today's hospital pharmacies are greater than ever before. With advances in pharmaceutical treatments and patient protocols, pharmacists and pharmacy technicians must remain focused on ensuring accurate medication fulfillment and minimizing adverse drug interactions and side effects. Aethon's automated robotic delivery solution, TUG, allows the pharmacy to improve the frequency and reliability of medication deliveries, ensuring secure scheduled and on-demand distribution from the pharmacy to the nurses' station. With its state-of-the art delivery technology, TUG can easily navigate through hallways, doorways, elevators, and even narrow aisle ways with human traffic to ensure safe, timely, and accurate delivery every time. With its 24/7 availability, nurses no longer need to waste time tracking down medications during night and weekend shifts, leading to increased time at the patients' bedside, better outcomes, and patient and employee satisfaction. Staff shortages and off-shift coverage are no longer an issue with TUG managing the delivery process. Refocus pharmacy staff on their core functions, reducing medical errors. For more information on how TUG can benefit your hospital, please contact Aethon. An automated guided vehicle or automatic guided vehicle (AGV) is a mobile robot that follows markers, GPS or wires in the floor, or uses vision or lasers. They are most often used in industrial applications as well as hospitals and labs to move materials around a manufacturing facility, hospital, lab, nursing stations/floors, food service or a warehouse. Application of the automatic guided vehicle has broadened during the late 20th century and they are no longer restricted to industrial environments. Automated guided vehicles (AGVs) increase efficiency and reduce costs by helping to automate a manufacturing facility, warehouse or hospital departments. AGVs can carry loads or tow objects behind them in trailers to which they can autonomously attach. The trailers can be used to move raw materials or finished product. The AGV can also store objects on a bed. The objects can be placed on a set of motorized rollers (conveyor) and then pushed off by reversing them. Some AGVs use fork lifts to lift objects for storage. AGVs are employed in nearly every industry, including, pulp, paper, metals, newspaper, healthcare and general manufacturing. Transporting materials such as food, linen, dietary delivery, lab specimens or medication in hospitals is also done. An AGV can also be called a laser guided vehicle (LGV) or self-guided vehicle (SGV). Lower cost versions of AGVs are often called Automated Guided Carts (AGCs) and are usually guided by magnetic tape. AGCs are available in a variety of models and can be used to move products on an assembly line, transport goods throughout a plant or warehouse, and deliver loads to and from stretch wrappers and roller conveyors. The first AGV was brought to market in the 1950s, by Barrett Electronics of Northbrook, Illinois, and at the time it was simply a tow truck that followed a wire in the floor instead of a rail. Over the years the technology has become more sophisticated and today automated vehicles are mainly Laser navigated e.g. LGV (Laser Guided Vehicle). In an automated process, LGVs are programmed to communicate (via an offboard server) with other robots to ensure product is moved smoothly through the hospital, whether it is being stored for future use or sent directly to nursing stations. Today, the AGV plays an important role in the design of new factories and warehouses and healthcare systems, safely moving assets to their rightful destinations. AGV applications are seemingly endless as capacities can range from just a few pounds to hundreds of tons... from lab specimens, and meals, to patient medications. Zone control is the favorite of most environments because it is simple to install and easy to expand. Zone control uses a wireless transmitter to transmit a signal in a fixed area. Each AGV contains a sensing device to receive this signal and transmit back to the transmitter. If the area is clear the signal is set at "clear" allowing any AGV to enter and pass through the area. When an AGV is in the area the "stop" signal is sent and all AGV attempting to enter the area stop and wait for their turn. Once the AGV in the zone has moved out beyond the zone the "clear" signal is sent to one of the waiting AGVs. Another way to set up zone control traffic management is to equip each individual robot with its own small transmitter/receiver. The individual AGV then sends its own "do not enter message" to all the AGVs getting to close to its zone in the area. A problem with this method is if one zone goes down all the AGV's are at risk to collide with any other AGV. Zone control is a cost efficient way to control the AGV in an area. Forward sensing control uses collision avoidance sensors to avoid collisions with other AGV in the area. These sensors include: sonic, which work like radar; optical, which uses an infrared sensor; and bumper, physical contact sensor. Most AGVs are equipped with a bumper sensor of some sort as a fail safe. Sonic sensors send a "chirp" or high frequency signal out and then wait for a reply from the outline of the reply the AGV can determine if an object is ahead of it and take the necessary actions to avoid collision. The optical uses an infrared transmitter/receiver and sends an infrared signal which then gets reflected back; working on a similar concept as the sonic sensor. The problems with these are they can only protect the AGV from so many sides. They are relatively hard to install and work with as well. AGVs can be applied to move materials in food processing (such as the loading of food and/or trays into sterilizers) and at the "end of line," linking the palletizer, stretch wrapper, and the warehouse. AGVs can load standard, over-the-road trailers with finished goods, and unload trailers to supply raw materials or packaging materials to the plant. AGVs can also store and retrieve pallets in the warehouse. AGVs are becoming increasingly popular in the healthcare industry for efficient transport, and are programmed to be fully integrated to automatically operate doors, elevators/lifts, cart washers, trash dumpers, etc. 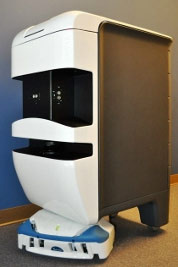 AGVs typically move linens, trash, regulated medical waste, patient meals, soiled food trays, and surgical case carts. Automated Hospital Delivery and Asset Management Solutions | Aethon improves healthcare efficiency and patient care by providing innovative robotic hospital delivery and asset management solutions. More than 100 hospitals throughout the United States currently employ customized Aethon solutions, allowing them to reallocate and refocus staff on what matters - the patient experience. 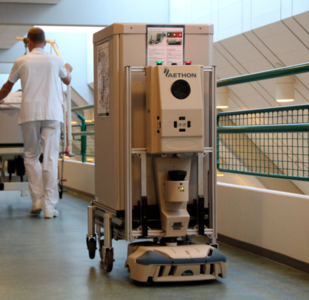 TUG, Aethon's Automated Robotic Delivery System (ARD), can transport both scheduled and on-demand hospital deliveries between all ancillary, support and patient care units. With the flexibility to efficiently manage deliveries that benefit multiple hospital applications, Aethon provides a 24/7 solution that increases both efficiency and accuracy, leading to the optimization of staff time and hospital dollars to patient care. Learn more about the Aethon TUG.